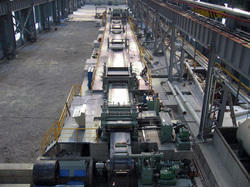 Prominent & Leading Manufacturer from Delhi, we offer continuous pickling lines. Jatindra Engineering Corporation is a leading supplier of both Continuous and Push-pull Pickling Lines that are equipped with compact scale breakers, the latest welders and turbulent pickling systems that are designed and optimized on the basis of extensive operational experience. Customers have the choice of different pickling concepts to meet their specific productivity requirements or preferences. Accurate strip and pickling control, fast and stable processes, and precise strip tracking are decisive factors for optimized pickling operations. The assurance of highest strip surface quality and cleanliness is paramount in importance to ensure reliable and cost-efficient downstream processing. JEC has been designing and manufacturing Pickling Lines and has supplied turnkey solutions in domestic as well as international arena. The experience and expertise distilled over time allows us to offer cost effective process lines as follows. JEC supplies the full range of solutions for descaling hot rolled strip. Pickling lines supplied by us are characterized by high pickling rates, low-cost operation, flexible production, and for a wide range of product sizes, qualities and coil weights. The lines are reliable in operation, have low maintenance and meet the highest standards of environmental protection. Applying the knowledge gained out of our extensive experience, and offers various combinations of pickling tanks for continuous pickling lines. This makes it possible for our customers to select the right type of tank, which best meets their needs. ¿¿¿Push-pull pickling lines offer significant advantages when it comes to investment costs and operational flexibility. This is the case particularly when client frequently changes strip dimensions and steel grades. JEC offers a uniquely designed U-shape flat pickling tank, which improves the strip stability during its passage through the tank. This eliminates strip buckling and flattening, and assures reliable threading. To prevent strip staining in the rinsing section, we have developed a special anti-stain system. The energy efficient design of the fume extraction and sealing system significantly reduces energy costs and acid losses.